In a week of generally cooler weather, it appears that the exodus of damselflies from the pond has slowed down, although as I am at work there is a chance that I missed some of them. However, this may be just as well, there have been lots of young sparrows and starlings generally kicking up a racket in the garden, but we have also had a young greenfinch feeding on the sunflower hearts. You can tell these apart from the adults by their stripiness. I have seen very few butterflies this week, but, now that the first of our honeysuckles has come out in flower I am hoping to see a lot more bees just outside the kitchen window. Most of the trees now seem to have their summer foliage on, even the ash and the oak are clothed in green. Onto the flowers….. I went out looking for orchids this week, but the place I saw them last year appears to have been mown to within an inch of its life. However, there are a lot more flowers out there waiting for you. 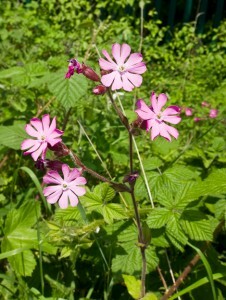 Firstly, brightening up many a hedgerow and road side is the pink campion. I spoke to someone a couple of years ago from the Peterborough area who said that at that end of the River Nene they mainly have white campions whilst the Northampton end is populated by the pink campion. This is a perennial plant, the pink apparently being a product of the white and red campion. 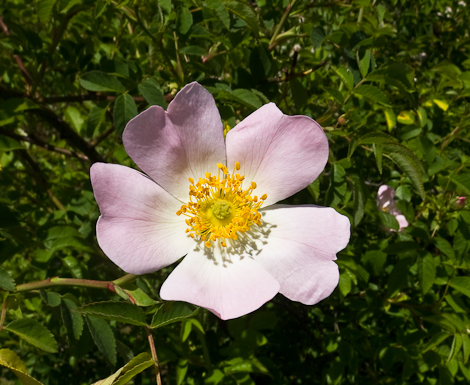 Not to be outdone by my favourite rose, rosa rugosa, the dog roses, rosa canina, are starting to appear in the hedgrows. These are mainly shades of pink, but some are almost white. This is James’s favourite, and we have some growing in the garden which we have grown from seed that we collected from the industrial estate. He wouldn’t let me plant Rosa Rugosa, maybe it was to make sure I kept going to work! Speaking of which, I no longer have to stop and snort, there are so many flowers out now that the air is filled with the scent in the morning. My final spot of the week are the cheerful ox-eye daisies (leucanthemum vulgare), members of the chrysanthemum family which are showing up at the roadsides now. You will have to excuse the picture, there are not many in the estate, and I have not managed to get to the edge of town where there are lots of them across from the scout hut. 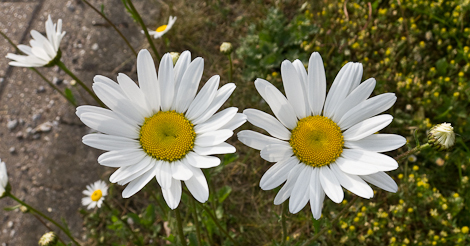 Interestingly, many herbivorous insects do not like the daisy, the juice is apparently very bitter, so it used to be mixed with animal bedding in order to deter flies. 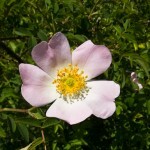 Posted on May 30, 2010 Categories NatureTags dog rose, ox-eye daisy, pink campionLeave a comment on A plethora of flowers.